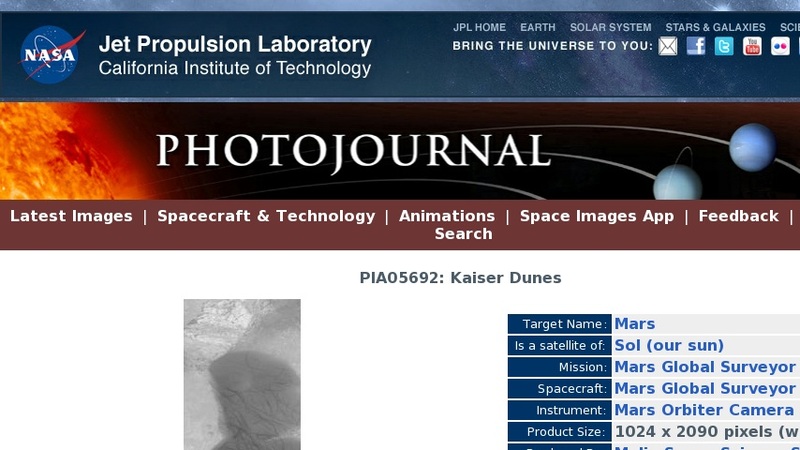 16 March 2004 Kaiser Crater, located in Noachis Terra near 46.5S, 340.7W, has some rather large, dark, sand dunes on its floor. Some of the dunes are seen in this February 2004 Mars Global Surveyor (MGS) Mars Orbiter Camera (MOC) view. Dark streaks on the dunes were formed by passing springtime and summer dust devils that disrupted a very thin, fine coating of dust on the dunes. The light-toned patch at the upper (north) end of this image is an exposure of the rock that underlies the dune field in Kaiser Crater. This picture covers an area about 3 km (1.9 mi) across. Sunlight illuminates the scene from the upper left.